From its inception, the intent of the Talk Clean to Me blog has been to educate about the choice and use of disinfectants. The content of our blogs are based on fact drawing from a myriad of published sources and smattered with analogies or stories of direct experiences and we hope a bit of humour. 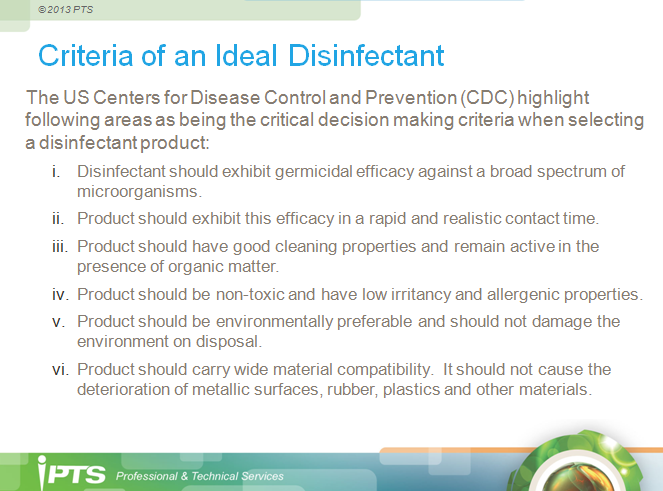 If we go back to the original blogs from the Spring and Summer of 2011, we started off weaving a story of the desired traits of a disinfectant targeting key areas to consider when choosing a product. Understanding that some may think the blog a bit self serving as both Lee and I work for a disinfectant manufacturer, it's rewarding to read Drs Rutala and Weber's article published in ICHE this July titled "Selection of the Ideal Disinfectant" as it highlights many of the same points we have been talking about since we launched Talk Clean to Me. Over the next several weeks, I will try to summarize the article and invite everyone to read it as it is truly a landmark piece that embodies the attributes that anyone who is choosing a disinfectant should consider. As hinted in my title, the focus of this blog will be on the first section "Kill Claims For the Most Prevalent Healthcare Pathogens" which closely resembles the idea behind our "Strength in Not Always Found in Numbers" blog. As Rutala and Weber highlight, the disinfectant product selected should be one that is effective against the pathogens that cause HAIs, and vegetative bacteria such as S. aureus, Enterococcus, E. coli, Klebsiella, Pseudomonas and Enterobacter have been found to cause almost 80% of all HAIs. I hope you'll take a look at Table 3 from the article as it summarizes the most prevalent pathogens that cause HAIs very nicely. Basically, the marketing ploy by some disinfectant manufacturers focuses on who has the greatest NUMBER of claims, not who has the most APPLICABLE claims....inferring that they are the most effective product is a carefully crafted game of smoke and mirrors. The next important area to understand is with respect to antibiotic resistance. Without a doubt, antibiotic resistance is a concern from a treatment perspective. As we touched upon in our "Doors, Keys and Sledgehammers " blog and confirmed by Rutala and Weber, disinfectant testing for antibiotic-resistant organisms is not necessary, as antibiotic resistant pathogens are not more resistant to disinfectants than antibiotic sensitive pathogens. There are however, some pathogens that are intrinsically more resistant to disinfectants than others which leads me to the third, and I think most important discussion of this section of the article - the concept of the order of susceptibility of microorganisms to disinfectants. When considering disinfectants, we also need to consider the hierarchical scale of susceptibility. The original hierarchy was developed by Spaulding in 1957 and is still widely cited in guidelines and policies, however, our understanding of pathogens and their susceptibility to disinfectants has dramatically improved. Rutala and Weber have proposed a new hierarchy which I completely concur with based on my experience of conducting efficacy testing on a number of different disinfectant actives. Regardless of the hierarchical scale you choose to follow it is imperative to understand that this is only a guide and that the efficacy of disinfectants to pathogens will vary depending on the disinfectant active as well as how the product is formulated (e.g. 2 Quat-Alcohol products with different formulations can have widely varied kill claims and contact times). As outlined in the article, a non-sporicidal disinfectant with a TB claim which traditionally was considered the most resistant vegetative bacteria does not mean that the product will have the ability to kill small, non-enveloped viruses such as Norovirus or Poliovirus. Another area where the hierarchy should be considered is with emerging pathogens such as MERS-CoV or Enterovirus D68. Emerging pathogens generally mean that there is not an approved test methodology for a disinfectant to obtain efficacy claims by the EPA. In cases such as this where the microbiologic class has been established, than an already approved surrogate could be used. For example, claims against Human Coronavirus would be appropriate to ensure efficacy against MERS-CoV or as in our "H1N1, H5N1, H10N8, H7N9 - What Influenza strain will we see next? " blog, proven efficacy against 1 strain of Influenza A would be sufficient to assume efficacy against emerging strains of influenza. Lastly, for viruses where the microbiological class has not yet been determined (e.g. when SARS first hit or Ebola where there is no test method to determine efficacy) then we would look for efficacy against the heartier non-enveloped viruses. Typically in these situations efficacy against Poliovirus, Adenovirus, Rhinovirus or Canine Parvovirus would be considered as this viruses are known to be more resistant to disinfectants than others. As Drs. Rutala and Weber so eloquently stated "using this accumulated knowledge of microbiological susceptibility should discourage unnecessary testing, listing irrelevant organisms on labels and avoid "bug-of-the-month" testing". Stay tuned for next week's blog which will focus on the second section "Fast Kill Times and Acceptable Wet-Contact Time To Ensure Proper Disinfection of Non-Critical Surfaces and Patient Care Equipment".